Kanpur city is located on the banks of the Ganges River in the state of Uttar Pradesh. It is the main center of Commercial & Industrial activities in the Uttar Pradesh state. There are various reputed engineering colleges like Indian Institute of Technology (IIT) & others are located in this city. These colleges offer from diploma to doctoral level courses in the engineering field. As per the data recorded by census 2011, the average literacy rate of this city is 79.65%. 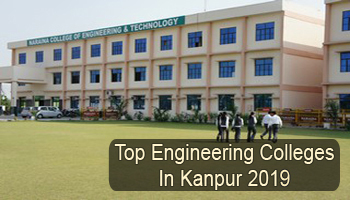 Through this article, candidates can check here the list of Top Engineering Colleges in Kanpur 2019. At Sarvgyan.com, we have provided a list of top engineering colleges in Kanpur 2019. Here we have listed colleges like IIT – Kanpur and many other governments and private colleges located in Kanpur city. While rating this list, various factors have been considered. The colleges have been rated on national importance, affiliation, and approval of colleges, quality of education, academic excellence, placement records, student’s preferences, college infrastructure & facilities. Students looking for admission into B.Tech courses can apply on the basis of rank secured in the JEE Main (national level exam) and UPSEE (state level exam). The application form for these entrance tests will be available via online mode. For admission in IIT, it is mandatory to qualify both (JEE Main & JEE Advanced) examinations. For admission in M.Tech programme, students can appear in GATE examination. There are various colleges are located in Kanpur city which offers a variety of specializations in engineering courses. Some top specializations are Computer Science & Engineering, Mechanical Engineering, Civil Engineering, Aeronautical Engineering, Electrical Engineering, Electronics & Communication Engineering, etc. For any other queries about Top Engineering Colleges in Kanpur 2019, you can ask us by leaving your queries below. sir mere JEE MAINS me 25 nuber hai so khi admission le skta hu ya koi college milega mere ko ……………….